Here's a great desert using the colors of the 4th of July. 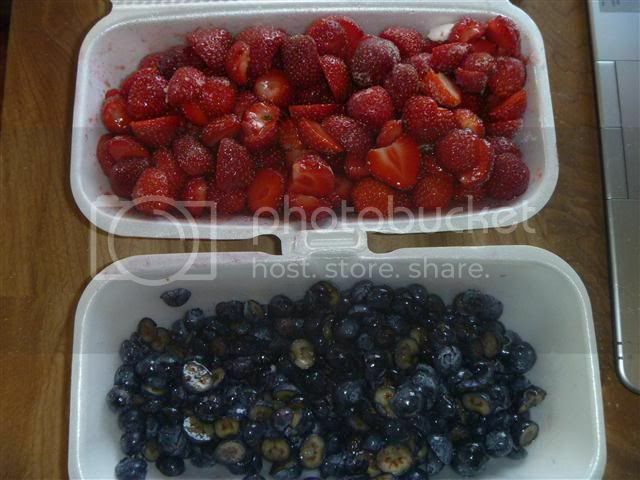 Cut strawberries and blueberries in half. Add 1/4 C white sugar to each. Mix well. Let stand 1 hour in the refrigerator. 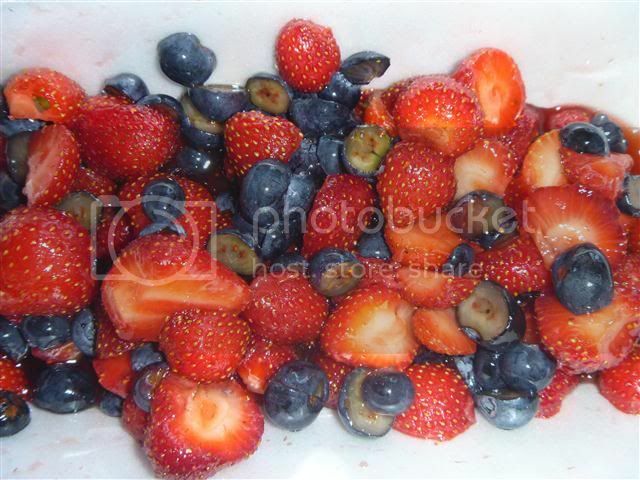 Combine strawberries and blueberries for the filling. Mix well.. Cover and return to the refrigerator until needed. If you have the time, make your own whipped cream or you can do as I did and use Redi-Whip Original. Dip or brush the top of each biscuit in cool water. Then dip the tops in Sugar in the Raw to lightly coat. Bake Pillsbury Southern Style Biscuits as directed. My small Breville convection oven took 8 minutes at 325. Rotate pan halfway through the baking process. Remove to a wire rack and cool. Slice each biscuit in half, horizontally. 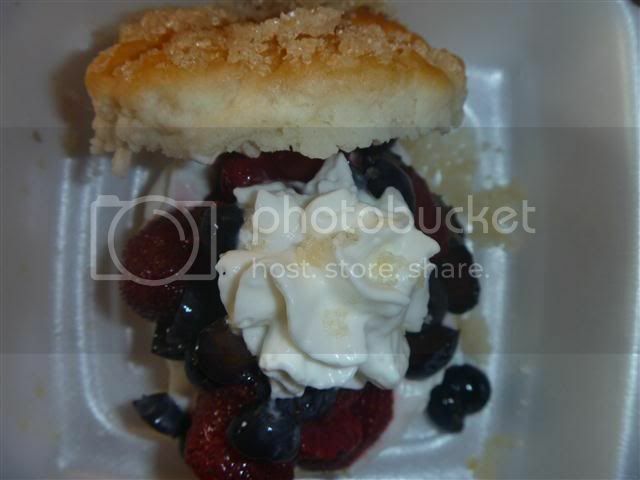 Put about 2 Tbsp of whipped cream on the bottom half of each biscuit, followed by 2 Tbsp of mixed berries, top with 1 Tbsp whipped cream. 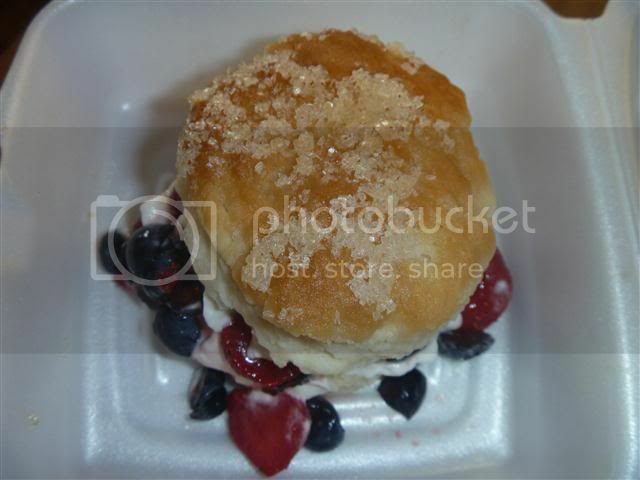 Place the biscuit top on the whipped cream to finish. *NOTE: If you use the canned Grands, bake them, let them cool, dip/brush tops with water, dip the tops in sugar and brown. Thanks for lookin' and ENJOY!